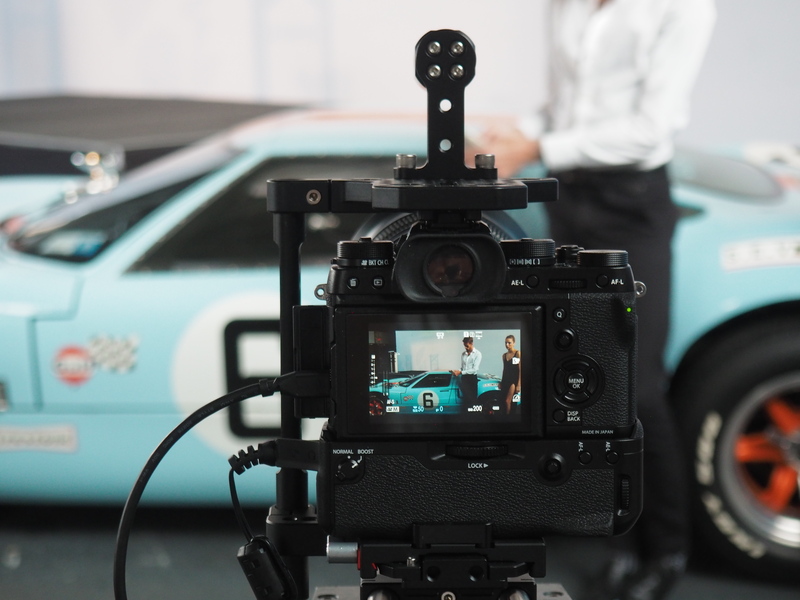 If you’re going to show off the follow-up to your well-loved mirrorless camera two years after release, you might as well do it in style — classic cars, rail-thin models, terrible music, the whole nine yards. 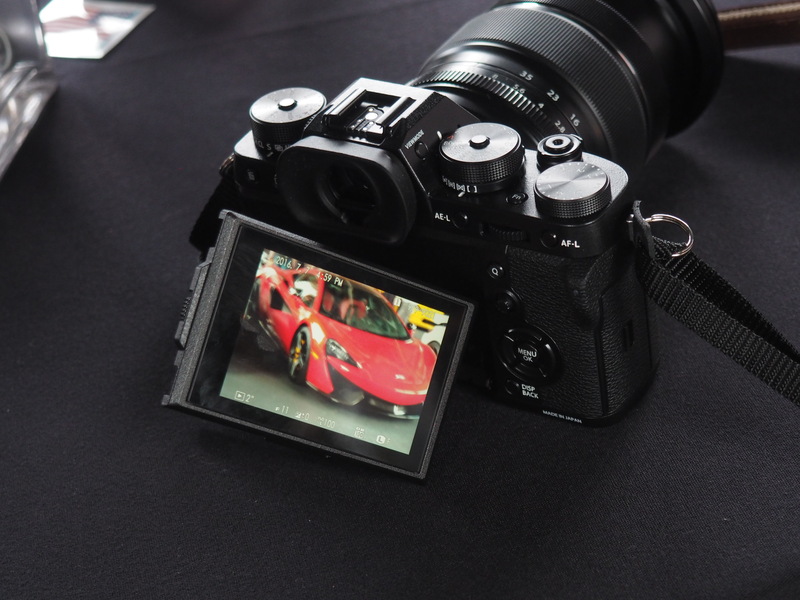 Fujifilm’s X-T2 interchangeable lens camera made its flashy Manhattan debut at the borough’s Classic Car Club, with a slew of different accessories and a number of its 22 compatible lenses in tow. The camera looks an awful lot like its predecessor (if just slightly larger), because why mess with a good thing? Built around what the company calls its “central viewfinder style,” the camera’s textured body weighs in at around 1.1 pounds (battery included), is water and dust resistant and capable of operating at temperatures as low as 14 degrees F.
There are plenty of upgrades present here, as one would expect after a two-year gestation period. Chief among them are the ability to shoot 4K video at 24, 25, or 30FPS (the first camera in the X family with that increasingly important feature) and a fancy pants new 24.3-megapixel (APS-C) X-Trans CMOS III sensor (versus the T1’s 16MP), capable of shooting images near comparable to a DSL-R. Inside is an X-Processor Pro chip, designed to offer the shooter more accurate autofocus, with 325 single points. Oh, and one other key spec: $1,600. That’s the starting price for the body alone. Another $300 will get you the kit lens (an 8-55mm). Which is to say, the X2 ain’t cheap, so far as mirrolesses go. That’s a notable increase over it predecessor, but from the time I got to play around with the thing, well, you’re certainly getting what you pay for here. As mentioned above, Fuji didn’t do much to mess with the layout, and the camera’s got a nice, lightweight feel that fits comfortably in the hand. The optional Vertical Power Booster Grip will add significant bulk to things, but it also effectively packs in an additional two batteries, which extend 4K video recording time from 10 to 30 minutes, among other things. Up top you’ve got a trio of big, beefy dials, which are great for on-the-fly shooting. ISO has been bumped up a fair bit, doubling from 6400 to 12800, and as promised, autofocus works ridiculously fast. And shooting great-looking 4K video is a snap. In fact, I’d go so far as to say beginners should pick things up quite quickly. I’m more of a viewfinder man myself, but for those who rely on the display, the three-inch screen has more articulation than before, adding left and right to the old vertical movement, for a total of three-directional titling. There’s a lot to like here. 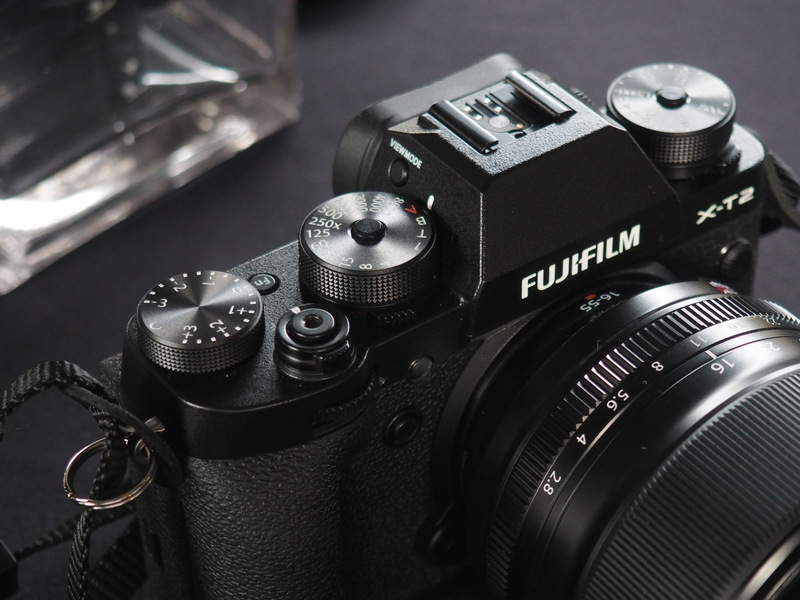 We’ll hold off complete judgment until we get some real quality review time with the camera, but as it stands, Fujifilm has built a worthy successor on top of a solid foundation. It launches in September, so start saving up those bottle caps now.